Limited onsite accommodations are available at the IKRC Grand Canyon. There are a number of hotels in Flagstaff available to book through the festival booking system - see offsite accommodation tab. Must be booked for the entire Festival: September 27-October 3 (6 nights), except for camping which can be booked for a minimum of 3 nights. Early arrivals (up to 2 nights) and late stays (Thursday night Oct 3rd) can be booked online with your registration, but are subject to availability. Breakfast is included in your accommodation fee. Lunch and dinner can be booked separately. No Wifi available onsite. There is limited mobile service depending on your carrier. Onsite parking is limited. This can be booked separately. Shared showers and bathroom facilities are available for those with camping or in dormitory accommodation. We regret we are unable to accommodate under 18s in shared rooms or dormitory accommodation. Children who are camping (in parents’ tent) are free of charge. It is not permitted for those under 16 to sleep in their own tent, but must share with an adult family member/nominated carer. This is a rustic location. Rooms are not accessible. Please contact Festival Registration for more info. Single, Double, Quad, 5 Shared and 6 Shared Rooms, are booked per room. The person booking is responsible for the full payment and for finding their own room-mates. Dormitory, indoor and outdoor camping reservations are per person. 25% deposit due on booking, non-refundable and non-transferrable. Full payment due by 12 September on all accommodation except for camping. This is non-refundable after this date unless we are able to re-sell accommodation. Onsite accommodation is in high demand, in order to be able to offer accommodation to those on the waiting list who might otherwise be unable to attend, failure to pay the deposit or balance payment by the dates indicated above will lead to the cancellation of your accommodation booking. This is non-refundable unless we are able to re-sell the accommodation. The Festival will take place at the International Kadampa Retreat Center Grand Canyon, which is located in Northern Arizona, between the cities of Flagstaff and Williams. This area is not the Arizona experience you would expect! The area is 7,000 feet (2,130 meters) above sea level and is surrounded by the largest contiguous ponderosa pine forest in the world. The area is filled with natural wonders, including the Grand Canyon (under one hour away from IKRC) and Sedona (just a one hour drive from IKRC). September and October is the start of the Fall foliage season. Daytime temperatures are generally in the mid-70s (23°C) with nighttime temperatures dropping into the low-40s (6°C). The majority of the official Festival hotels are in Flagstaff. Each hotel was selected for its quality, price, nearby amenities and its ability to enhance the Festival experience. 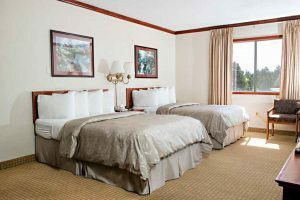 Although there are many other hotel options in Flagstaff and Williams, the quality and price of these other hotels cannot be guaranteed. Wherever you are in Flagstaff, you have wondrous views of the ponderosa pine forest and the San Francisco mountain peaks, including Humphreys Peak, the highest point in Arizona at 12,633 feet (3,851 meters). Flagstaff is sometimes called the City of Seven Wonders due to its proximity to seven natural monuments and places of beauty. The Westside of Flagstaff hosts Northern Arizona University. This area hosts many shopping centers, grocery stores, restaurants and coffee shops. The three Festival hotels in this area--the Springhill Suites, Courtyard and Baymont--are all within walking distance of each other. The Eastside of Flagstaff is a quickly developing area. The Quality Inn, Rodeway Inn & Suites and the Holiday Inn Express are all located right off of Interstate 40 and are within walking distance of each other. Many restaurants and grocery stores are within walking distance of these hotels. The Hampton Inn & Suites, Fairfield Inn & Suites, and Sonesta ES are all within walking distance of each other and are located in the Country Club area on the Eastside. These hotels have fewer local amenities but are surrounded by exquisite views. It is just a quick bus or car trip from this area into the heart of Flagstaff. Many of the buildings in the Downtown area date back to the early 1900s. Downtown Flagstaff offers a wide variety of dining with many dietary options. The historic buildings also house many art galleries, unique local shops and coffee shops. The Hotel Aspen Inn & Suites and Days Inn W Route 66 are within walking distance of Downtown. Known as the Gateway to the Grand Canyon, Williams provides an eclectic mix of Americana--cowboys, railroad and 50s nostalgia! Route 66 is the main street through town, with six blocks of local shops and restaurants. Williams is surrounded by the Kaibab National Forest, with many options for outdoor activities. The Circle Pines KOA is located between the Festival site and Williams (5 miles outside of downtown Williams).